Yesterday marked the kick-off of an 1,100 mile bike trek for 17-year-old John Ellis and his best friend, Jamaal. 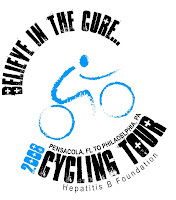 They are riding their bikes from Pensacola, Florida to Philadelphia to raise awareness for the Hepatitis B Foundation. John will be blogging along the way at http://believeinthecurecyclingtour.blogspot.com/. Please check it out and cheer him and Jamaal on. John posted his first day's blog recap at http://believeinthecurecyclingtour.blogspot.com/2008/06/day-01-closer-to-clouds.html. His words are truly inspirational! Please spread the word and share this great story. And if you're in the Philadelphia area on June 23rd, join us at 10 AM at Lloyd Hall on Kelly Drive (Boat House Row). We want to show John and Jamaal how our City of Brotherly Love comes out and support those who care to make a difference.